Your collection calendars are now available in a variety of methods for your convenience. 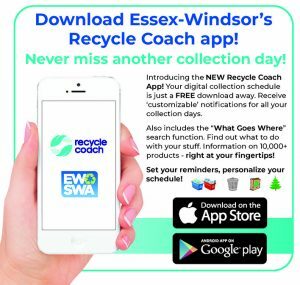 Recycle Coach App: You can download the FREE Recycle Coach app at the Apple Store or Google Play. Set reminders for your collection days and receive notifications when a collection day changes due to a holiday. Print calendars: Mailed out to every single family household in the New Year. If you just moved in or lost yours you can contact your municipality and they will send you a new one. PDF: You can download your municipal calendar in pdf (see below for links). 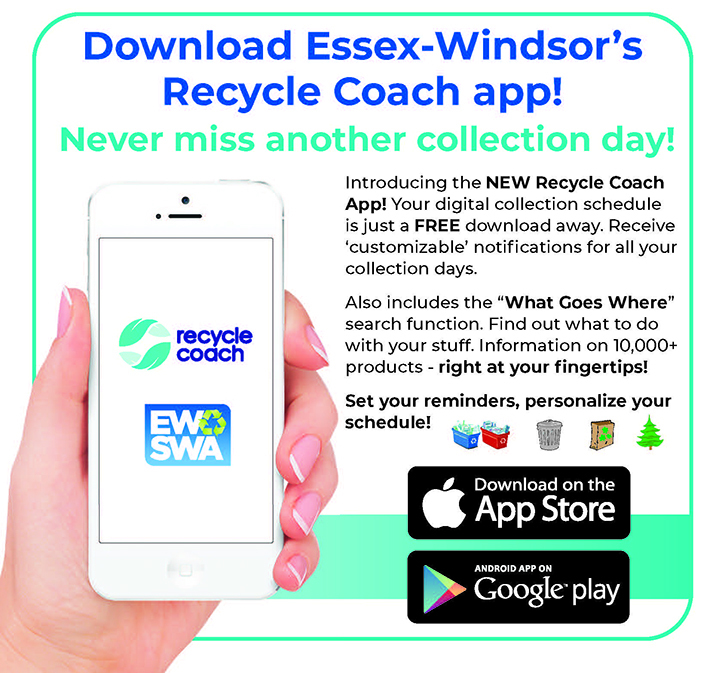 City of Windsor residents – click on link City of Windsor Collection Calendar Page to be taken to Windsor’s calendar web page. One Page PDF: All the County municipalities’ collection days are on one sheet. See below for link. 2019 Collection Calendars will be distributed by your municipality in mid January. If you do not receive your 2019 municipal collection calendar by the second week in February, please contact your Municipal Office for a hard copy. The 2019 calendars are available in pdf by download below. Full Colour, page per month calendar February 2017 through January 2018. Recycling, Garbage, Yard Waste & Household Chemical Waste information. Guidelines for waste reduction and recycling. Municipal Directory & maps included. The entire booklet style calendar is available here but the files are large. You can choose to save the file onto your computer rather than opening it online. To do this click on the text link, when calendar opens up, right click and choose “save as” – choose a destination and press save. Alternate Formats: The 2019 collection calendars are available in alternate formats upon request. Please call 1-800-563-3377 or email ask@ewswa.org. Hard Copy: If you require a calendar mailed to you, contact your Municipal office. The phone numbers are listed (below) on this page and email addresses are provided where available. Your 2018/19 Collection Calendars are valid until March 31st, 2019. If you need a calendar, contact 311.